Buster The Clown (William Forsythe of THE DEVIL'S REJECTS) is a mentally challenged man who sells ice cream out of his Cheery Tyme truck until a cruel prank by a bunch of neighborhood boys goes horrifically wrong. A generation later they're all grown men with families, but the crime of their past may now be trolling for their children: Buster and his truck have returned for sweet revenge, and ever… y frozen treat will bring its own taste of Hell. 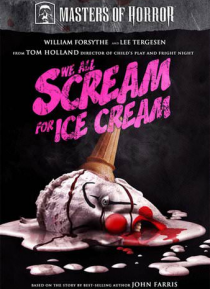 Lee Tergesen (THE TEXAS CHAINSAW MASSACRE: THE BEGINNING) co-stars in this tasty chiller adapted by 'splatterpunk' writer David J Schow (PICK ME UP) from the short story "I Scream, You Scream, We all Scream, for Ice Cream" by best-selling author John Farris.